Mouette Villa is absolutely gorgeous, with a huge outdoor area and breathtaking views of the Caribbean. I love that both levels have several porticos and terraces, so you can follow the sun throughout the day while you tan. This villa is perfect for families or groups of friends. 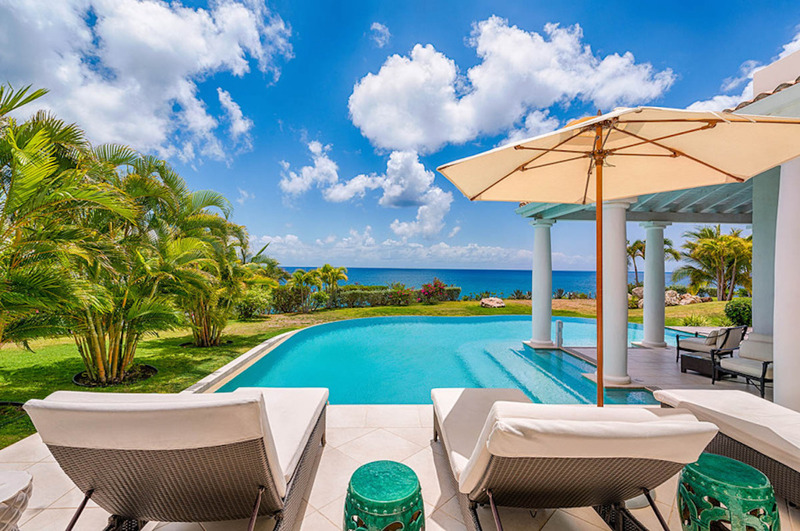 Mouette Villa is spread out over two levels on a bluff overlooking Baie Longue. The ground floor has an expansive infinity pool and columned portico that lend luxury to the outdoor area. Loungers give guests space to sunbathe, and the outdoor dining space has a BBQ grill for al fresco feasts. This space opens to the indoor dining area and kitchen. There’s a study to the side of the dining room, and a porch behind the fully equipped kitchen. The living room is next to the dining area, and opens to the covered terraces. Both bedrooms on this level feature king-sized beds, flat screen TVs, ensuite baths, and air conditioning. One bedroom on this level opens to the pool area. The upper level also has a spacious outdoor area. On the balcony, there’s additional dining space and loungers to take in the view. There’s a pergola and several terraces on this level, as well as a game room. There are two bedrooms on this level, each with a king-sized bed, flat screen TV, and ensuite bath. Guests have access to La Samanna’s resort amenities, such as tennis courts, fine dining, a spa, swimming pools, and boutiques. The resort is located on Baie Longue beach, and Marigot is a 10 minute drive away.